An apple and prune chutney made in Cornwall with multi-award-winning Artisan Malt Vinegar. The Manaccan Primrose is an old Cornish apple variety. 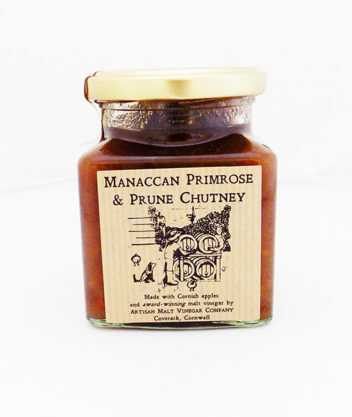 With a fluffy texture and a primrose-yellow skin, it makes an ‘ansom chutney. Slowly stewed with all natural ingredients, no artificial additives, and the world’s finest malt vinegar, it’ll go down lovely with a bit of cheese, of ham, or turkey.